(1) They may be produced by the fragmentation of larger bodies formed earlier by accretion. The asteroids have traditionally been regarded as fragments from one or more planets mat have exploded or have been broken up by mutual collisions. In a similar way, the meteoroids may be fragments of comets, or possibly from other bodies like the asteroids. Although for reasons discussed in secs. 9.8, 11.8, and 18.8 me asteroids in general cannot have been derived in this manner, mere is no doubt mat destructive collisions occur in interplanetary space and that a number of small bodies are fragments from larger bodies. (2) Small bodies must also necessarily be formed by accretion of grains, produced by condensation of me plasma mat existed in the hetegonic era or later, and by accretion of fragments formed in breakup events. Accretion of such grains and fragments to larger bodies mat finally become planets or satellites is a basic tenet in all "planetesimal" theories. To clarify this process, it is important to find and identify surviving primeval grains in interplanetary space. 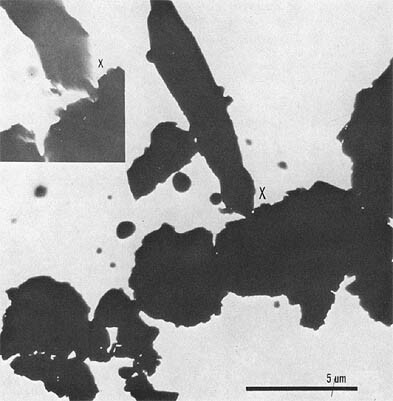 Certain types of meteorites contain particles whose structure and composition strongly suggest that they are such preserved primordial condensate grains (see fig. 7.1.1). An important problem in our analysis is to determine the relative rates of fragmentation and accretion in the small-body populations. Even without a detailed analysis of this question, me mere existence of these bodies demonstrates mat, integrated over me age of the solar system, accretion must on me average have prevailed over fragmentation. (2) The study of their size spectra. The theory is given in sec. 7.2 and the observations again in secs. 4.3, 18.6, and 18.8. (3) The study of the record in meteorites and on the Moon. The observations relevant to accretion and fragmentation are discussed in ch. 22. The number of particles in the interval between R and R + dR is denoted by N(R), and the functions N( ) and N(m) are defined in similar ways. with a = -1. In case a = 0, we obtain instead a logarithmic dependence. If a > 0, the smallest particles are most numerous and we cam often neglect the second term. with b = -2. If b > 0 (which often is the case), the smallest particles determine the total cross section. with c = -2. If c < 0 (which often is the case), the largest particles have most of the mass. Table 7.2.1 presents a summary of the mass, cross section, and size spectra for various values of , , and g.
In order to get a feeling for the correlation between different physical processes and the related size spectra, we shall derive such spectra for three very simple models. The models represent the development of large bodies from small bodies through two types of accretion and the development of small bodies from large bodies through fragmentation. Our basic approach is to describe a state of accretion or fragmentation and discern the boundary conditions and size spectra indicative of each state. TABLE 7.2.1. Survey of Spectra and Models. where we have made use of the previously assumed constancy of . Under these conditions, the embryo size spectrum is given by = 0, = O.5, and = 0.67. As shown in table 7.2.1, for this type of spectra the mass and cross section distributed among the accreting embryos is concentrated in the more massive bodies; the size spectrum is constant for all values of R.
We conclude that a state of gravitational accretion under the conditions that = constant and dR/dt = constant R2 indicates spectra where =2, = 1.5, and = 1.33. As shown in table 7.2.1, for this type of spectra small grains are most numerous and account for most of the cross section, but the mass of large bodies dominates. In a simple model of fragmentation, we consider a collection of bodies in a jet stream and particles with an initial random size spectrum. The collisions occurring in the jet stream will result not in accretion, as described above, but in fragmentation. We assume that whenever a body is hit it is split up into n smaller bodies that all are identical. Hence the cross section  for fragmentation is proportional to or to m2/3. This implies that bodies in the interval m to m+ m are leaving this interval at a rate proportional to . At the same time, bodies are injected into the interval by the splitting of bodies in the interval nm to , and this occurs at a rate proportional to (nm)2/3. which is satisfied if = 5/3. Thus we find that a state of fragmentation, given the conditions noted above, indicates spectra characterized by = 3, = 2, and = 5/3. As shown in table 7.2.1, for this type of spectra small bodies are most numerous and cross section is concentrated in the small bodies, but the mass is concentrated in the large bodies. Piotrowski (1953) has worked out a model that is essentially the same as given here. The power law with = 3, a = 2 is often referred to as Piotrowski's law. Dohnanyi (1969) takes account of both the fragmentation and the erosion at hypervelocity impacts and finds = 11/6, and, consequently, = 3.5 and a = 2.5. All the theoretical models seem to agree that the result of fragmentation is that most of the mass remains in the largest bodies, and most of the cross section is due to the smallest particles. Hence, if the size distribution in the asteroid belt were determined mainly by fragmentation, a large amount of small particles would be expected. If collisions in the asteroid belt are mainly in the relative velocity range where accretion results, the high cross sections of the smallest particles will cause their removal into larger aggregates and truncation of the size distribution. The particle distribution measurements made by the Pioneer 10 space probe to Jupiter are of great interest in connection with the question of relative rates of fragmentation and accretion. These measurements showed that, contrary to what would be expected if fragmentation would proceed at a higher rate than accretion, the concentration of small particles (10-1500 µm) in the asteroidal belt remained at the low background level found on either side of the belt (Kinard et al., 1974). in contrast, the larger particles (1.5-15 cm), as expected, showed an increase as the probe passed through the asteroid belt (Soberman et al., 1974). This suggests either that the fragmentation process does not produce a significant relative amount of particles in the 10 1500 µm range or that these particles are accreted as fast as they are formed. The theoretical considerations above and the observation of impact material on the Moon make the former alternative highly unlikely. Given a jet stream continually replenished by injected particles, one can conceptually follow the development of these particles into embryos and eventually into one secondary body. Initially the jet stream is a composite of particles in dispersed orbits. Collisions will, as shown in ch. 6, increase the similarity of the particle orbits. Even in the first period after being focused, the jet stream is probably in a state of net fragmentation. Hence, there must be a transition from net fragmentation to net accretion before a jet stream can evolve into a secondary body. It is reasonable to assume that the internal velocity of the jet stream is the decisive factor in the balance of fragmentation and accretion processes. At large velocities, collisions produce fragmentation. At smaller velocities, collisions result in accretion. Determining the velocity distribution in the transition region is a complex problem. It involves not only particle-particle interactions, but also the interaction of particles with clusters forming at the lower end of the velocity spectrum. ....measured adhesion strength (10-200 dyn) and dipole moments (10-6 to 10-7 esu) indicate that such cluster formation would begin to be effective at relative particle velocities in the range 1-10 m/sec. 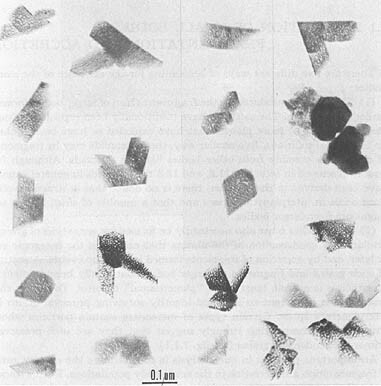 Magnetostatic interaction between magnetized grains (which form only a small fraction of the mass), as evidenced from magnetite clustering in meteorites (sec. 22.7), would occur in a similar low relative particle velocity range (Harris and Tozer, 1967). Hence collisions in space may to a considerable extent take place between fluffy bodies, which have collisional properties substantially different from those of solid bodies, particularly in the subsonic velocity range. As we have very little experimental information about collisions between fluffy bodies, the discussion of the collisions in space necessarily must be highly speculative. An important process after that stage would in such a case be the collision of remaining higher velocity particles with particle clusters of low bulk density (~0.1-1 g/cm3). 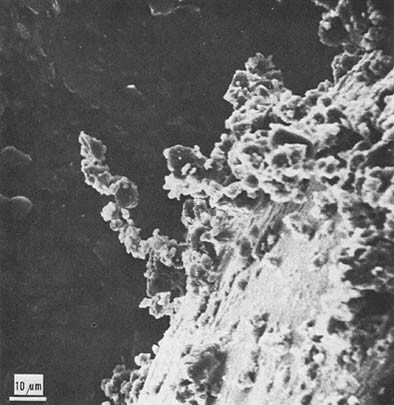 Experiments modeling the hypervelocity part of this situation were carried out by Vedder (1972), who bombarded fluffy basalt dust with grain sizes in the range 0.1-10 µm with hypervelocity projectiles in the form of polystyrene spheres 2 to 5 µm in diameter. Also under these circumstances the ejected mass exceeds the projectile mass by two to three orders of magnitude. Hence, it seems unlikely that electrostatically' bonded particle clusters can accumulate mass from projectiles with velocities exceeding several km/sec. Ballistic experience indicates, however, that particles in the subsonic velocity range could be captured in loosely bonded particle aggregates of sufficient size without net mass loss due to! secondary ejecta. Hence, we have here, as an order-of-magnitude approximation, assumed effective accretion to begin at average relative velocities of about 500 m/sec in a population of particles constituting a jet stream.